programs through Church World Service. 1946 Church World Service began with 17 protestant denominations working together to help rebuild Europe and feed hungry people after WWII. A year later in 1947 through CWS, Christian clergy and farmers in the US formed CROP (Christian Rural Overseas Program) as a way to send seed, grain, and livestock to war-torn Europe. 1968 CROP WALK began on October 17th in Bismarck, North Dakota, raising-$25,000 with 1,000 people walking 25 miles! 1979 The first CROP event in the Red Bank area was a small band of people, organized by Rev. David Muyskens, Shrewsbury Presbyterian pastor, who cleaned up the beach and raised over $3000. In 1980 they held a volley-ball-athon. 1981 First Red Bank CROP WALK was organized by Sarah and Len Dunikowski from Tower Hill Presbyterian Church. 15 churches participated, raising $6,127. 1982 CROP grew 19 churches participated. 25% of funds went to 4 local hunger fighting agencies. Rick Weaver led the Coordinating Committee in 1983 and 1984. 1985 Janie Schildge takes on the charge of CROP WALK Coordinator. 2010 will be her 25th year! In the next few years schools started participating. Rumson Country Day School and Christian Brothers Academy were early leaders. 1990 Sister Donna D'Alia, Church of the Nativity, gathers our first teen committee together. Red Bank Walk celebrated 10 years of bringing communities together to walk to fight hunger. 1991 Our walk was dedicated to Sarah Dunikowski, former Crop Coordinator and Music Teacher at Forrestdale School in Rumson, who died of leukemia in 1990. 1997Our two youngest walkers at age 5, Halyley Glossbrenner and Katie Day, were asked to cut the start ribbon and were recognized by CWS for completing the walk. 2000 20th Red Bank CROP WALK raised over $100,000 in this 20th Walk! Church World Service updates C.R.O.P. to a more inclusive description of efforts to fight hunger in our world - Communities Responding to Overcome Poverty. 2004 Mrs. Chun, 94 years old, from South Korea, cut our START Ribbon as the oldest walker. 2005 25 years of walking for 15 local partner programs and global partners in 80 countries. Original participating churches and schools were honored. The Varley family spearheads the food collection, and invites CBA boys to help sort, count, and carry food for the pantries. 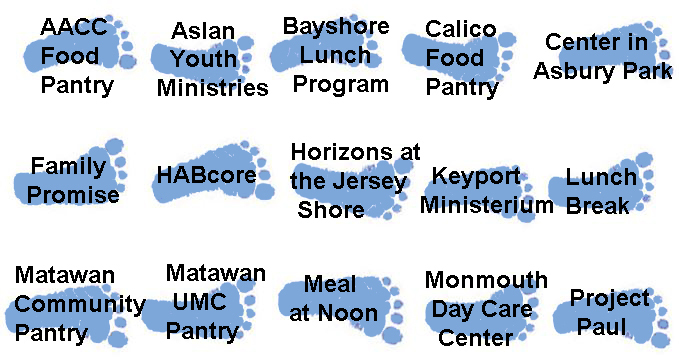 2007 Over $141,000 was raised to feed the hungry in Monmouth County and around the world! Over 3 1/2 tons of food was collected, and this walk was a RECORD HIGH in all stats! 50 schools and independent groups participated. Top fundraiser Red Bank Catholic HS cut the ribbon. 2008 The 28th Walk had over 1300 walkers and raised $126,000 in an economic slowdown. Red Bank CROP WALK was recognized among the top 5 walks and the largest volunteer run/walk nationwide. DJ John Limyansky cheers walkers! 75 churches participated. 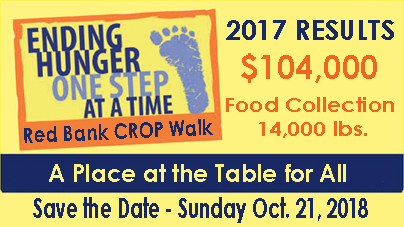 2009 2/3 of our usual walkers and runners braved cold and rainy weather for the first time in 29 years of the Red Bank CROP Hunger Walk. Despite economic gloom, spirits were high as walkers donated 6,700 pounds of food for local pantries and raised $111,000. 2010 Red Bank CROP WALK celebrated its 30th Anniversary on, Oct. 17, 2010. 11, 000 lbs of food was collected...a record. Despite a poor economy the walk raised $120,000. up from 2009 With the dedication of all our volunteers we have raised over 2 million dollars in the walk's 30 year history. CWS through its global partners provided assistance to the people affected by the earthquake in Haiti. There is Enough for All. 2011 CROP Walk #31 began our 4th decade of walking to End Hunger on World Food Day, Sunday Oct. 16,2011. Our walk this year was dedicated to the Memory of Sue Glossbrenner our materials coordinator and valued CROP volunteer committee member for over 30 years. Sue's dedication to CROP greatly contributed to its growth and success. 2012 CROP Walk #32 continued our 4th decade of walking to raise funds to end hunger. Donations totaled over $114,000 and we collected over 13,000 lbs of food for 20 local pantries one week before Super Storm Sandy hit the Jersey Shore. We witnessed the Church World Service response to our disaster and the relief they provided to our NY/NJ region. We walk to help CWS provide disaster relief nationally and internationally. This year we found ourselves on the receiving end. CWS was there for us. 2013 CROP Walk #33 one year post Super Storm Sandy, CBA bagpipers played as walkers stepped out to end hunger. Walkers raised $106,500 and donated over 2 tons of peanut butter, rice, and beans valued at $15,000. food was distributed to 20 local food pantries. Our t-shirt design saw the addition of walkers walking around the heart & sole to signify that we walk for our 17 local partners and through CWS global partner programs, for those experiencing extreme poverty & hunger around the world. 2014 CROP Walk #34 broke yet another food drive record. 8 tons (16,000 lbs.) of food was collected for 20 local pantries. We're back on an upward trend with total funds of $110,000. Our funds help Church World Service to fight hunger and poverty while promoting peace and justice around the world. We had new volunteer groups and participating faith groups join us as we walked to change the world and end hunger. 2015 CROP Walk #35. We raised $116,000 , up $6,000 to help end hunger in communities here and around the world! Nearly 100 faith groups, schools, civic groups and individuals came together to give a resounding High Five to Ending Hunger with our 35th Hunger Walk. We learned more about the continued strife of refugees around the world and how Church World Service Global can help. 2017 CROP Walk #37. 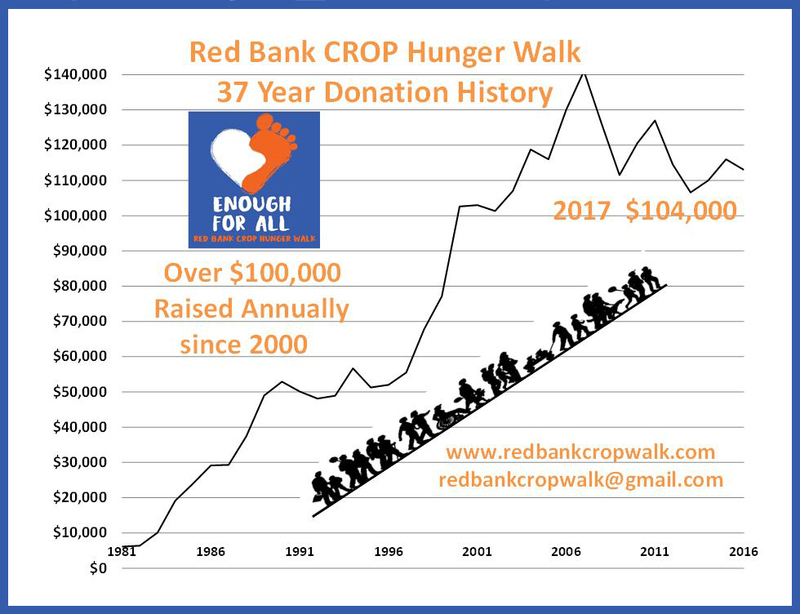 Our 18th year raising over $100,000 which was greatly needed as local and global programs fought to respond to continued food insecurity and worked to help those affected by climate induced natural disasters. We showed the film, "A Place at the Table", we had a new Penny Challenge Program at Red Bank Primary School, and we collected 14,000 lbs. of food for two dozen pantries. The Wag Band, members of Musicians on a Mission, played lively music to fire up the walkers!